The high tenor (also known as a soprano pan) is the highest pitched of the steel drums (steel pans) with a pitch range of D4 to F#6, that is, up to two octaves and a major third from D above middle C (C4). Its predecessor actually contained fewer notes which were within the tenor range. However, the name "Tenor" was kept despite the higher range of its descendant, the soprano pan. 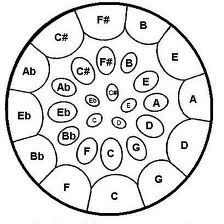 The notes of this pan is arranged in the cycle of 4ths, going clockwise. In the latest standardised version of the double tenor steel drums,the Eb note is on the left hand pan and the F# is on the right hand pan. In an earlier version of this pan, the Eb is on the right hand pan and there was no F#3. So you went from F3 to F#4 to G3 and up, which broke the continuity of the range. 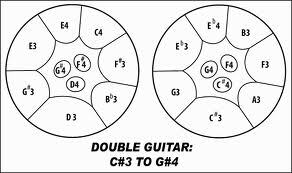 There is even a double tenor which has the lowest F# (F#3) on the left and the other F#'s on the right, with the Eb also on the right. So, if you decide to play this pan you must be mindful of its variations. 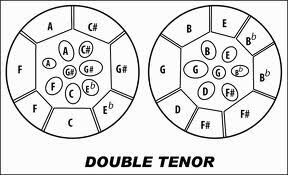 The arrangement of the notes on the double tenor is not symmetrical, which makes it one of the more difficult instruments to master. The versatility of the double second steel drums makes them capable of playing lead, harmonic voices, chords (harmony) or counter melody and they are very popular among soloists. They have a very unique (floaty) tonal quality which may be due to the "whole tone" arrangement of the notes of each pan. The sound of the double second steel pan is slightly deeper than that of the double tenor because it has a longer skirt.